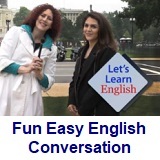 ﻿ Fun Easy English - new american english standard conversation Voice of America VOA learning English for intermediate lesson 6 Will It Float? discourse. Lesson 6 - Will It Float? In this lesson Anna takes Penelope around the city on a tour vehicle. Is it a bus? Is it a boat? Yes! The Duck Bus/Boat. It goes on land. It goes on water. Penelope: Anna, thanks for taking me on a tour of D.C. today. Anna: Sure thing, Penelope. You are new to town. And a tour is the best way to see more of the city! Penelope: So, which tour are we taking – the one that goes through the city on a bus? Or the one that goes along the river in a boat? Penelope: What? Anna, this isn’t going to be one of those trips, is it? 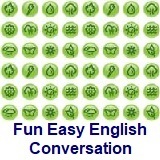 Professor Bot: In this lesson, you are going to hear lots of prepositions! What’s a preposition, you ask? It’s a word that shows relationships between things. Anna says they are going on a tour through the city and along the river. Through and along are both prepositions. Watch for more! Anna: Well, Penelope, there’s our ride! Anna: It’s the famous DC Ducks -- the boat with wheels! We will ride on the road and then sail on the water! Penelope: Who thinks of these things? Anna: I don't know. But I’m glad they do! Let’s get aboard, Sailor! Penelope: (looking at a brochure about the boat) Hey, did you know that this bus … um, boat was created during World War II to carry people and supplies? Anna: Wow. You know, a tour is so much more interesting with Fun Facts, like that one. Penelope: I agree. I love Fun Facts! Boy: Did I hear you say you love Fun Facts? Boy: Well, I have tons of Fun Facts for this tour! Anna: Penelope, where are his parents? Penelope: Maybe - maybe he’s the Captain’s son and he helps his dad on tours! Anna: Oh yeah! It would be so awesome to ride around the city in a boat all day with your dad! Penelope: This is amazing, Anna. There are so many beautiful buildings along this road! Anna: Hey, the Washington Monument is on the left! Professor Bot: I have a Fun Fact too! Did you know that the Washington Monument was damaged in an earthquake? Whoa. Did you feel that?! I heard: "around the city in a boat," "along this road and "on the left." All of these are prepositions showing place. Let's watch for more places and prepositions! Penelope: Look, Anna, we’re across from the White House! Anna: Penelope, the only thing between us and the President is the street … and a park … and a security gate .... and police officers … with guns. Boy: Excuse me, do you want to know a Fun Fact about the White House? Boy: Inside the White House there is a swimming pool, a movie theater and 32 bathrooms! Penelope: Thirty-two bathrooms! That’s a lot of bathrooms! Boy: I’d be happy with two. I live in a house with my mom, four sisters, two aunts and only one bathroom! Penelope: Oh my! You know, Anna, we should give him a tip! Anna: Of course! It is polite to tip your tour guide! Luckily, I have lots of dollar bills! Penelope: That was a great Fun Fact! Here you go! Boy: Thank you! I can tell you Fun Facts all day! Professor Bot: Did you hear any more prepositions of place? I heard "between us and the president" “inside the White House" and "in a house." And did you hear that the Duck Boat can go on the river? I don't believe it. 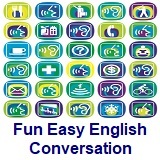 Join us next time to find out which preposition we will use: The boat went ON the river or The boat went INTO the river? through - prep. 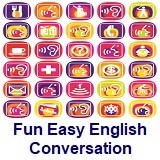 used to describe movement within a place or an area of land, air, etc.